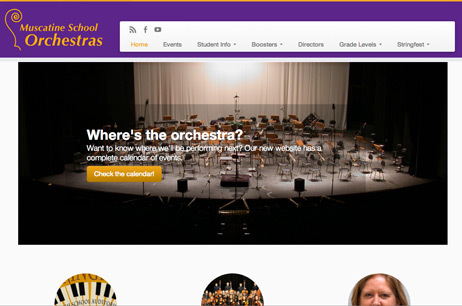 The Muscatine School Orchestras Booster Club was looking for a fresh start for their new website. They had an old site that hadn’t been maintained and needed a new look. The list of desired features was long and the timeline was short, so I rolled up my sleeves and got started. From the ground up, I wanted this to be a responsive site (one that adapts to the device’s screen size). The result was a WordPress-based theme that looks great on any device. The navigational menu disappears into a menu button for mobile devices, saving screen real estate and focusing on the content. Speaking of content, the client has full control of most every aspect of the site. With my video instruction, they can add or delete pages, images, text, and more. It’s a flexible site that should last for years.